Hi everyone, I have had a very good couple of days – it seems my birthday this year has gone for four days. I have been to lots of lunches, lots of dinners including one tonight and lots of cards, messages and pressies. Thank you to all my friends and family for making this year so special, I have felt really spoilt. My camera has also been very busy over the last few days so I have quite a few photos to share over the next few days. 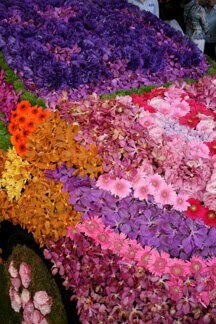 As I have already mentioned on Thursday I worked at the International Flower & Garden show. Some of the flower displays were amazing, one being the flower covered car. 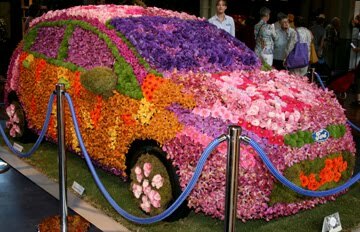 The day prior I was there dropping some stuff of and watched as they superglued flowers (both real and silk) all over the car. “Davine Time” update: The last few days I have spent a lot of time spoiling myself. This is something we all should do not only on our birthdays. I totally agree, Davine, that birthdays should be celebrated for DAYS at a time, rather than just hours, and that we should make the commitment to spoiling ourselves often. YAY! Funky looking car and I'm so happy to hear that you've had a wonderful birthday, all wonderful ladies deserve special days! I am so glad you had such a good birthday!! You deserved to take care of you!! Belated Happy, Happy Birthday! This colorful creation looks very celebratory and reflects the fun of it all. Many happy returns of a glorious day.